The paper mill was on the site of Rainow Mill [in Ingersley Vale by Mill Lane where the green shed is today], which had been a corn mill in 1611. I can find no reference to the history of the mill between 1611 and the late 18th century, by which time it had become a paper mill. The Bollington Civic Society archive includes part of a document by which Joseph Wagstaff granted permission to George Antrobus to dam the stream above Antobus’s cotton mill [Higher Mill], provided that the level of the water was not raised above that at the bridge “near the said Joseph Wagstaff’s paper mill” (10). The document is undated, but probably dates from the early days of Higher Mill, which was founded in 1789 or 1790 (see below). The Rainow land tax returns describe Rainow Mill as being in the ownership and occupation of Joseph Wagstaff between 1794 (the first year in which the returns name the properties being taxed) and 1796. From 1797 to 1802 (the last year in which properties were described) it was owned and occupied by Lawrence Wagstaff (11). A deposition of 1806 by a Rainow millwright, William Richardson, tells us that the paper mill was converted to a cotton spinning mill in 1801 by Lawrence Plant Wagstaff and his partner William Watts (12). This company of paper makers was founded in Castleton, near Rochdale, by Major Backhouse. In 1876 they moved the business to Bollington, but I don’t yet know which mill they occupied. While here Major Sidney Coppock joined Backhouse in partnership and the company name changed. Later the Major’s son Colonel Backhouse and stepson Mr G H Mason joined the business. They then moved the business out of Bollington to Pickford Street, Macclesfield, and later still to Sutton Mill. It would be interesting to know whether this firm actually made paper or whether it took in stock and further processed it. Paper making requires a great deal of water and I suspect that our rivers would not have provided sufficient for such a process. The main products were embossed, fancy and enamelled papers and cards. Very similar, in fact to the products of the two paper coating companies in Bollington today – Tullis Russell and Slater Harrison. It is interesting to note that while these latter two have been in Bollington a long time, they were not the original paper coating business in Bollington. Lower Mills (pictured below) is the home of Tullis Russell , one of the major employers in Bollington. This employee owned company takes in paper and card stock and processes it to add coatings for various purposes. For example, they apply the glue to the back of stamp paper which is supplied to many countries all around the world. The present company was established in 1929 (company history ). Today they are housed at Lowerhouse Mill at Lowerhouse. They process paper and card stock by adding coloured coatings, often shiny or fluorescent, particularly for the retail display industry – promo boards and signs in shops. 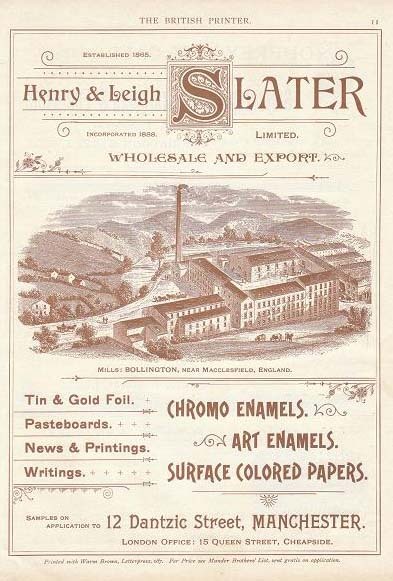 An earlier company, Henry & Leigh Slater, was incorporated in 1888, and were located at Lower Mills, where Tullis Russell are today, around the turn of the 19th and 20th centuries. See below their advertisement from the British Printer magazine of the late 19thC showing a fine engraving of the mill at the end of Church Street. There is some artistic licence in the form of the surrounding hills!